"Mohamed VI" redirects here. For the Moroccan monarch, see Mohammed VI of Morocco. Mehmed VI Vahideddin (Ottoman Turkish: محمد السادس‎ Meḥmed-i sâdis, وحيد الدين‎ Vahideddin, Turkish: Vahideddin or Altıncı Mehmet), who is also known as Şahbaba (meaning "Emperor-father") among his relatives, (14 January 1861 – 16 May 1926) was the 36th and last Sultan of the Ottoman Empire, reigning from July 4, 1918 until November 1, 1922 when the Ottoman Empire dissolved after World War 1 and became the nation of the Republic of Turkey on October 29, 1923. The brother of Mehmed V, he became heir to the throne after the 1916 suicide of Abdülaziz's son Şehzade Yusuf Izzeddin as the eldest male member of the House of Osman. He acceded to the throne after the death of Mehmed V. He was girded with the Sword of Osman on 4 July 1918, as the thirty-sixth padishah. His father was Sultan Abdulmejid I and mother was Gülüstü Hanım (1830 – 1865), an ethnic Abkhazian, daughter of Prince Tahir Bey Çaçba and his wife Afişe Lakerba, originally named Fatma Çaçba. Mehmed was removed from the throne when the Ottoman sultanate was abolished in 1922. Mehmed VI was born at the Dolmabahçe Palace, in Constantinople on January 14, 1861. The First World War was a disaster for the Ottoman Empire. British and allied forces had conquered Baghdad, Damascus, and Jerusalem during the war and most of the Ottoman Empire was divided amongst the European allies. At the San Remo conference of April 1920, the French were granted a mandate over Syria and the British were granted one over Palestine and Mesopotamia. On 10 August 1920, Mehmed's representatives signed the Treaty of Sèvres, which recognised the mandates and recognised Hejaz as an independent state. Turkish nationalists rejected the settlement by the Sultan's four signatories. A new government, the Turkish Grand National Assembly, under the leadership of Mustafa Kemal (Atatürk) was formed on 23 April 1920, in Ankara (then known as Angora). The new government denounced the rule of Mehmed VI and the command of Süleyman Şefik Pasha, who was in charge of the army commissioned to fight for the empire against the Turkish National Movement (the Kuvâ-i İnzibâtiyye); as a result, a temporary constitution was drafted. The Grand National Assembly of Turkey abolished the Sultanate on 1 November 1922, and Mehmed VI was expelled from Constantinople. Leaving aboard the British warship Malaya on 17 November, he went into exile in Malta; Mehmed later lived on the Italian Riviera. 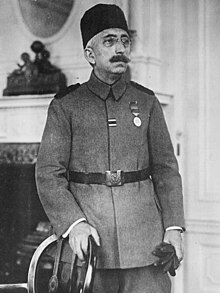 On 19 November 1922, Mehmed's first cousin and heir Abdulmejid Efendi was elected Caliph, becoming the new head of the Imperial House of Osman as Abdulmejid II before the Caliphate was abolished by the Turkish Grand National Assembly in 1924. Mehmed died on 16 May 1926 in Sanremo, Italy, and was buried at the Tekkiye Mosque of Sultan Suleiman the Magnificent in Damascus. Departure of the former emperor Mehmed VI from Dolmabahçe Palace after the abolition of monarchy, 1922. Photograph of Mehmet VI by Sébah & Joaillier, c. 1920. A portrait of Mehmed VI. Fatma Ulviye Sultan (11 September 1892, Ortaköy Palace, Ortaköy, Istanbul, – 25 January 1967, İzmir and buried at Çengelköy, Üsküdar, Istanbul, first married to Damat Ismail Hakki Okday Beyefendi (Athens, 28 October 1881 – Istanbul, 11 October 1977) at the Kurucheshme Palace, Istanbul, on 10 August 1916, with issue; second marriage to Damat Ali Haidar Beyefendi (Göztepe, Istanbul, 20 September 1889 – Istanbul, 5 February 1962) at the Nişantaşı Palace, Nişantaşı, Pera (today Beyoğlu), on 1 November 1923, also with issue. Rukiye Sabiha Sultan (Ortaköy Palace, Ortaköy, Istanbul, 1 April 1894 – Istanbul, 26 August 1971), married to her cousin Şehzade Ömer Faruk (the Ortaköy Palace, Istanbul, 27/29 February 1898 – 28 March 1969/1971), son of Abdulmejid II, at the Yıldız Palace, Istanbul, on 29 April 1920 as his first wife, and had issue, three daughters including, Fatma Neslişah Sultan. Circassian (of the Ubykh tribe) Inşirah Hanım (née Seniye Voçibe, Batumi, 10 July 1887 – Cairo, 30 June 1930), married at Istanbul, Üsküdar, Çengelköy, Çengelköy Palace on 8 July 1905 and divorced on 7 November 1909, daughter of Zekeriya Aziz Bey Voçibe, without issue. Şehzade Mehmed Ertuğrul (Çengelköy Palace, Çengelköy, Üsküdar, Istanbul, 5 September 1912 – Cairo, 2 July 1944). No Issue. Abkhazian Nevvare Hanım (née Ayşe Çıhçı, Adapazarı, 4 May 1901 – 13 June 1992), married at Istanbul, Dolmabahçe Palace on 20 June 1918, daughter of Mustafa Bey Çıhcı by his wife Hafize Hanım Kap, without issue. Albanian Nevzad Hanım (Istanbul, 2 March 1900 – 23 June 1992), married at Istanbul, Yıldız Palace on 1 September 1921, daughter of Şaban Efendi Bargu by his wife Hatice Hanım, without issue. ^ Freely, John, Inside the Seraglio, 1999, Chapter 16: The Year of Three Sultans. ^ a b c d e f Harun Açba (2007). Kadın efendiler: 1839-1924. Profil. ISBN 978-9-759-96109-1.